Description: National Geographic photographer and explorer Reza Deghati known as REZA talks about the power of visual media have to affect social changes and how it can change one's perspective of humanity. He talks about the helplessness and dismay of humankind caught up in torment, but he also shares the cultures of the world to which they belong, the traditions, the history and, above all, the infallible hope of a better world. Description: In this workshop, participants have the opportunity to review their photographic works with REZA individually or in group. REZA will teach lessons in photography during the workshop. Admission: Free and open ONLY to students. Space is limited for this workshop and registration is required. Applicants can be any USC or Non-USC students in any major who are interested in photography and have some photographs (amateur or professional) to present for review. To register, please please fill out the Registration From. Requests will be reviewed and 15 students will be selected for this workshop and will be notified with the the details about the workshop. A philanthropist, idealist, humanist, Reza Deghati known as REZA began his career with studies in architecture. He has gone on to become a renowned photojournalist who, for the last three decades, has worked all over the world, notably for National Geographic. His assignments have taken him to over a hundred countries as a witness to humanity’s conflicts and catastrophes. His work is featured in the international media (National Geographic, Time Magazine, Stern, Newsweek, El País, Paris Match, Geo…), as well as a series of books, exhibitions and documentaries made for the National Geographic Channel. Author of twenty-nine books, and a recipient of many awards over the course of his career, he has shared his humanitarian vision through more than 250 installations and photographic exhibitions throughout the world. REZA is also a Fellow of the National Geographic Society, and a Senior Fellow of the Ashoka Foundation. 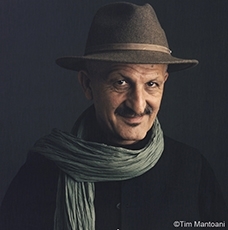 REZA’s work has been recognized by World Press Photo; he has also received the Infinity Award from the International Center of Photography, the Lucy Award, an honorary medal from the University of Missouri and the honorary degree of Doctor Honoris Causa from the American University of Paris. France has also appointed him a Chevalier of the National Order of Merit. This event was made possible by the generous support of Farhang Foundation (farhang.org).